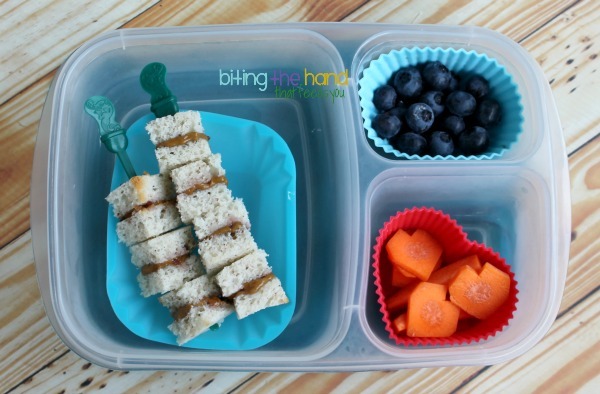 Biting The Hand That Feeds You: A Week of Fun and Easy Gluten-Free Lunches! 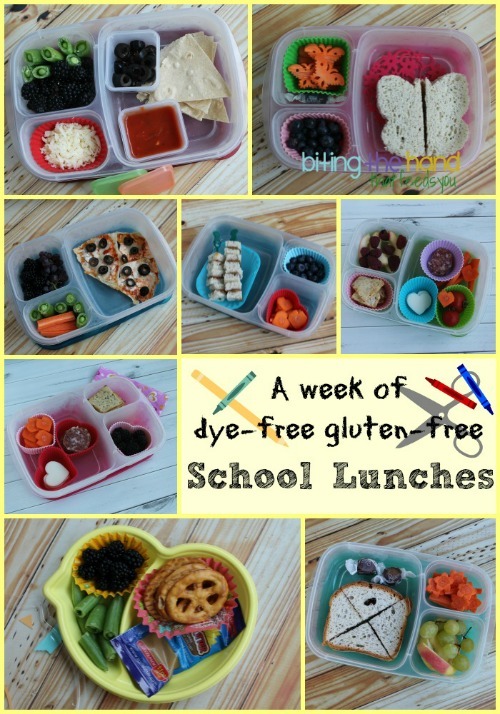 A Week of Fun and Easy Gluten-Free Lunches! 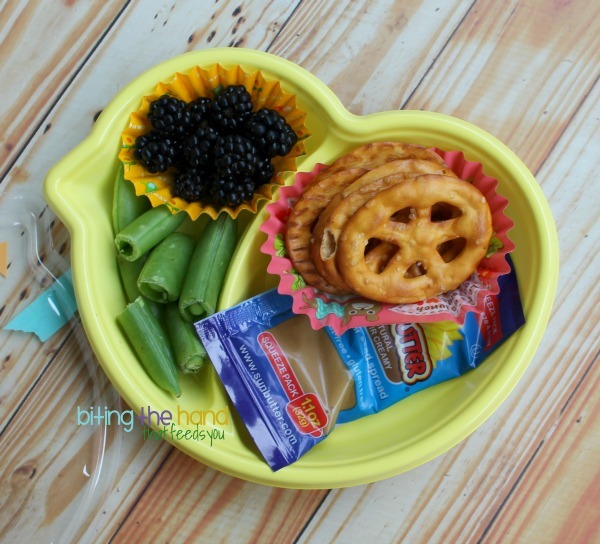 These lunches were packed last August when Z tried a week of the all-day Summer program at her new school, to see if they'd be a good fit for each other before I enrolled her for the school year. Some days I packed ahead for Little Sis too, if we had places to be. *spoiler alert* Clearly the school turned out to be a great fit! I am so glad we opted to pull her out of public school. It's great for most kids - I thrived in public schools growing up. But my child needed something different, and I will forever be grateful that they still had a space open so late in the Summer! Monday, 8/4/14 - My spice-sensitive kiddo loves gourmet salami! Anything else would be "too spicy" for her, as it is for me. But for some reason, she can tolerate these, as long as we don't buy a peppery variety. 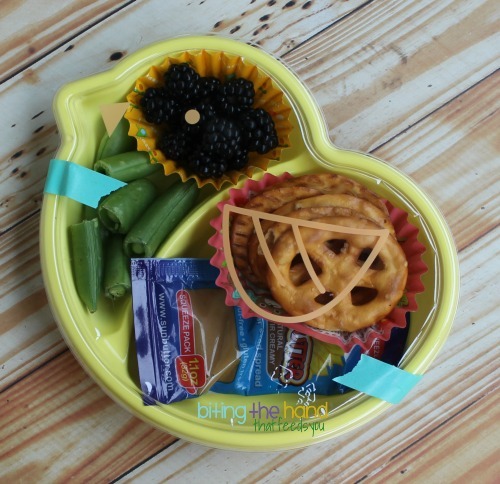 Since I had cut her carrot coins into hearts (freehand,) I went ahead and used silicone heart cupcake molds to separate all the ingredients, and a mini heart cutter to make the goat cheese shapes for the Cracker Stackers. 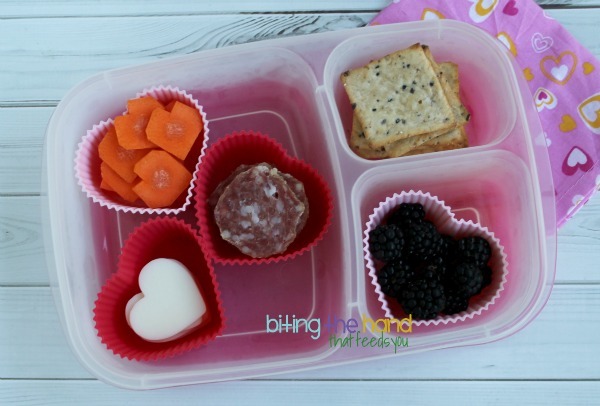 And I threw in a cloth napkin with a heart print as well, to complete the theme. Little Sis doesn't yet get the concept of combining foods for a party in your mouth, so she eats all her bits separately. She isn't a big fan of the salami or cheese, but will sometimes eat them. This day was not one of those times. 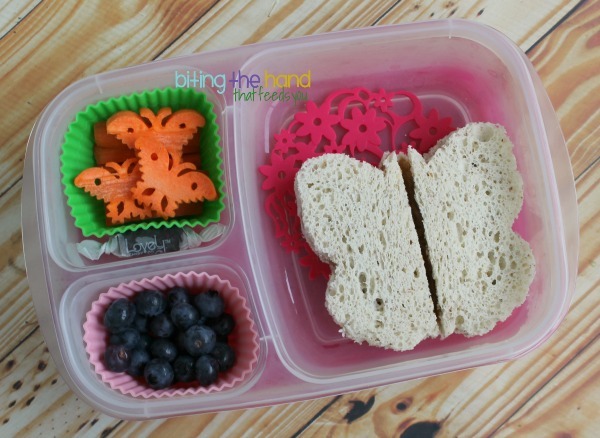 Tuesday, 8/5/14 - I chose to cut her sandwich with a butterfly sandwich cutter to go with the fancy butterfly veggie cutter carrots. 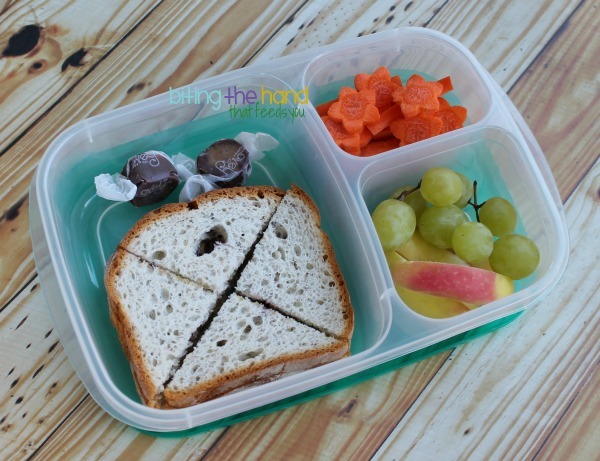 The silicone coaster under the sandwich helps fill the space and adds color, plus it helps prevent the sandwich halves from sliding around in the EasyLunchbox! Little Sis got the scraps from Z's sandwich cut up into little sandwich bites. I skewered them on Starbucks drink stoppers, since they aren't sharp, they're flexible (so small bits are unlikely to break off,) and they're free! 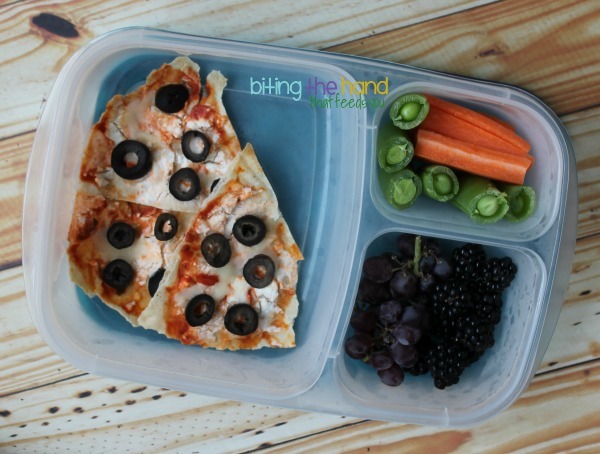 Wednesday, 8/6/14 - DIY Pizzables are popular with kids, despite being served and eaten cold (*shudder*) and my 1st Grader is no exception! She likes being empowered to make her own decisions as to how much of each topping to add, as well as how to eat it. Dip, spread, sprinkle, pile... it's all up to her! 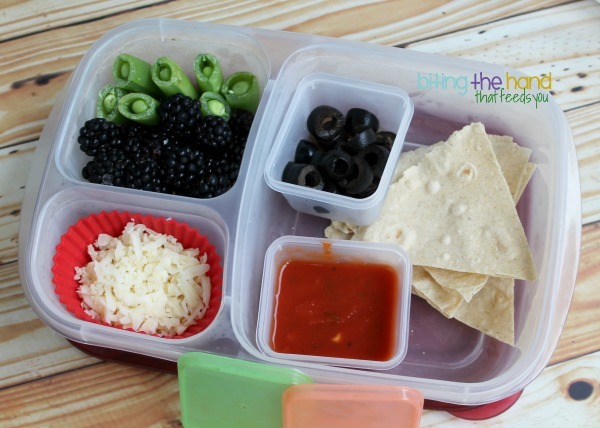 I sent the wet toppings in leak-proof Mini Dippers so the lightly-toasted tortillas wouldn't get soggy. My sister isn't afraid to bake, so she often makes a gluten-free pizza crust for us when we visit. We had just been down for my nephew's birthday party, so I had some leftovers for the toddler. Omnomnom! Thursday, 8/7/14 - As part of the Summer program, they'd go on a different field trip each weekly session. This week was a bike ride (or a car ride, for those who weren't skilled enough on two wheels yet) to a field day at a nearby park. 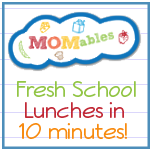 Since she'd be riding in the car with the lunches and some other kids, I didn't technically need a disposable lunch, but I sent one anyway. Z doesn't have the best track record of keeping track of all her things. 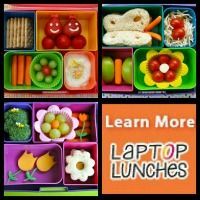 I found these flimsy polystyrene bento boxes with lids at Daiso a few years ago and grabbed a pack to use for something like this! I used a disposable bento cup to keep her berries separate, and a disposable oval bento cup for her pretzel chips. 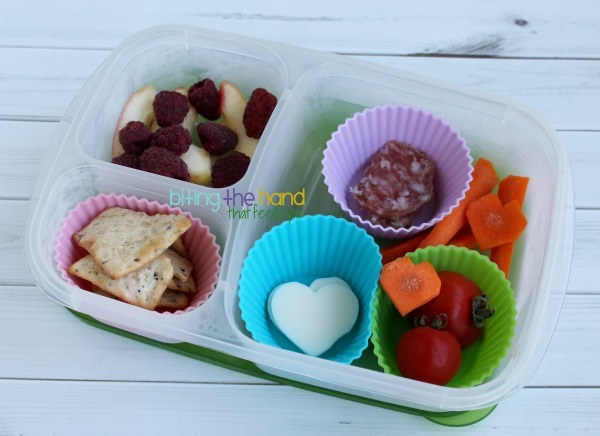 These cups are disposable like paper muffin liners, but the pattern is on the INSIDE to be seen better in lunches, and there's a thin lining of plastic to help prevent moisture transfer. 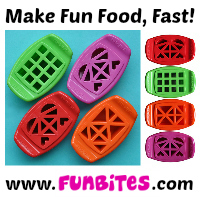 Wasteful, but fun when you're supposed to throw everything away! See the birdie details on the lid? So cute! The lid doesn't stay on well, so I used some colorful washi tape to secure it until lunchtime. 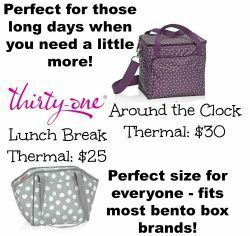 Friday, 8/8/14 - By Friday I was burnt out and out of ideas! So a quickie PBJ cut into triangles was all the creativity I could muster! I did manage to bang out a few carrot flowers using a small flower veggie cutter though. Since I always try to include a treat on Fridays, I sent a few all-natural chocolate caramel chews. They have dairy in them, so I can't eat them. But a small enough amount I can let the girls have them once in a while without ill effects. 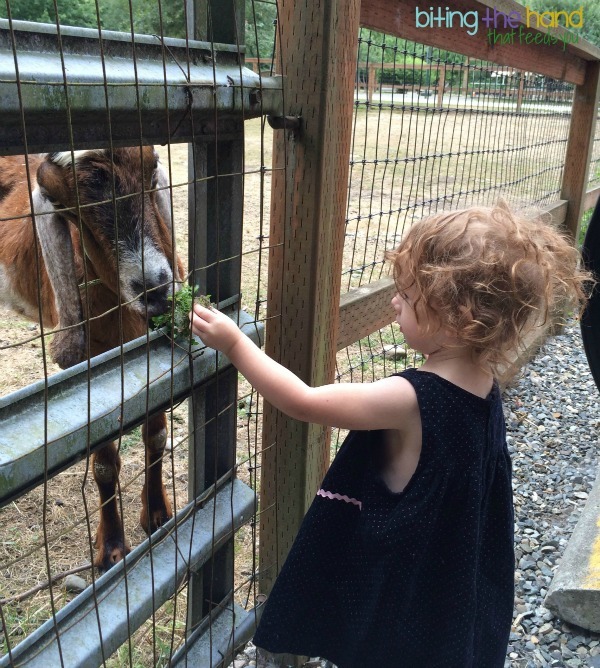 Bonus: Here's a pic of Little E feeding one of the goats at Z's new school. We started saving our wilted greens and carrot tops and such to bring after school each day, since both girls enjoy feeding the goats and sheep and llama and alpaca! And when we run out, the girls start pulling weeds! Lol!